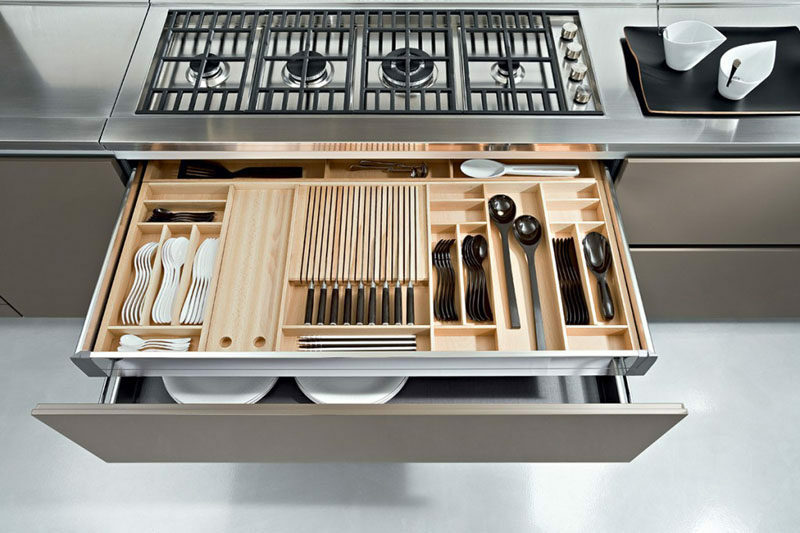 With all the things it takes to stock a kitchen, kitchen drawers can quickly start to overflow with gadgets, utensils, plates, and food. Getting them organized is a great feeling but it can take a long time to sort out if you don’t know where to start. Here are a few inspirational ideas for getting your drawers under control to prevent them from feeling overwhelming and out of hand. 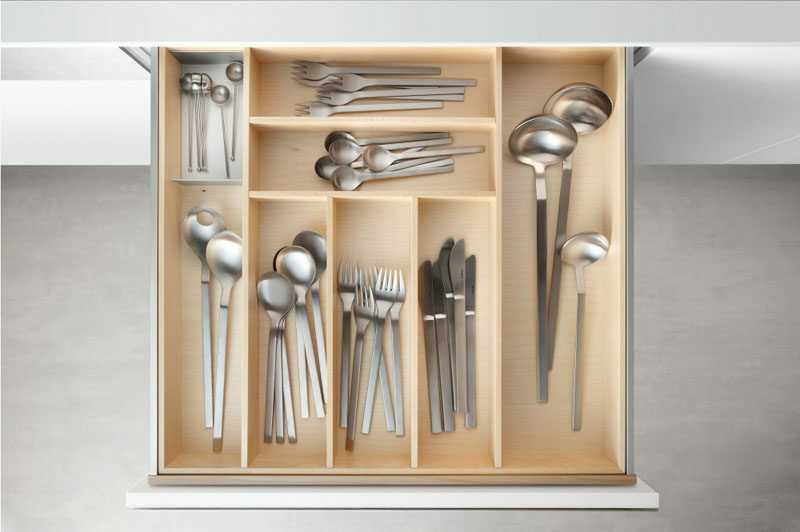 Perhaps one of the most satisfying feelings is opening a drawer, reaching in, and grabbing exactly what you went in for without having to shuffle things around and dig through a mess of cutlery and utensils. 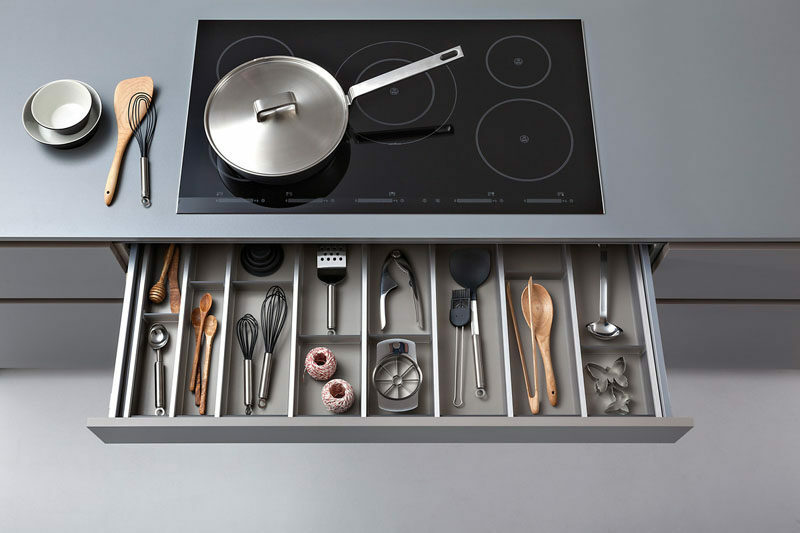 Dividers in this kitchen drawer below the stove keep everything organized and make it super easy to find exactly what you’re looking for when you need it. 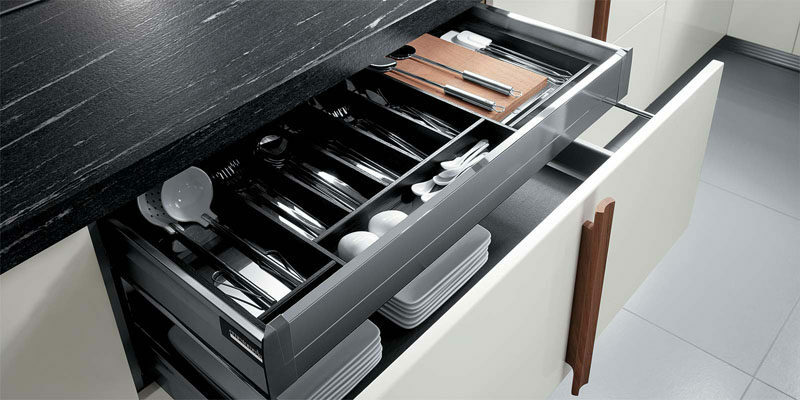 Cutlery and other frequently used utensils sit in this organized top drawer and are easy to grab when you need them. 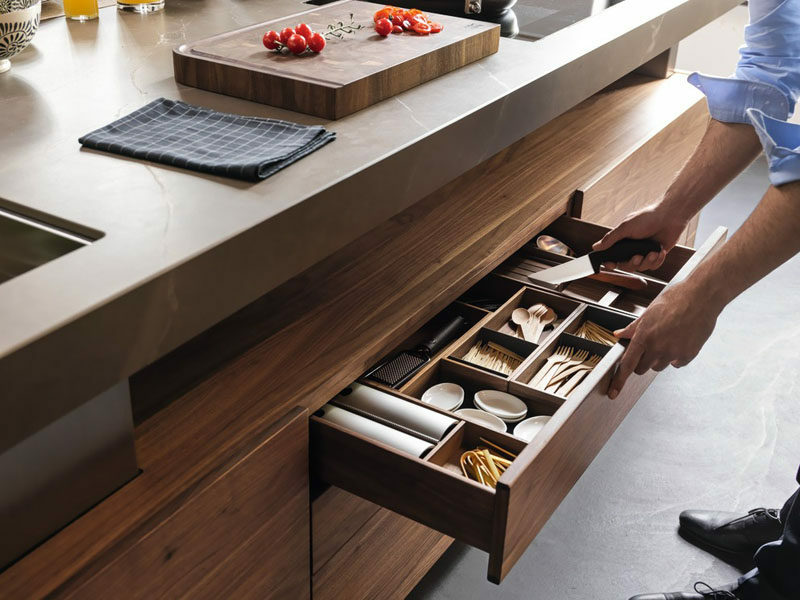 This wide drawer holds all of the essentials, including daily cutlery, frequently used utensils and favorite spices, to make cooking and food prep that much easier. 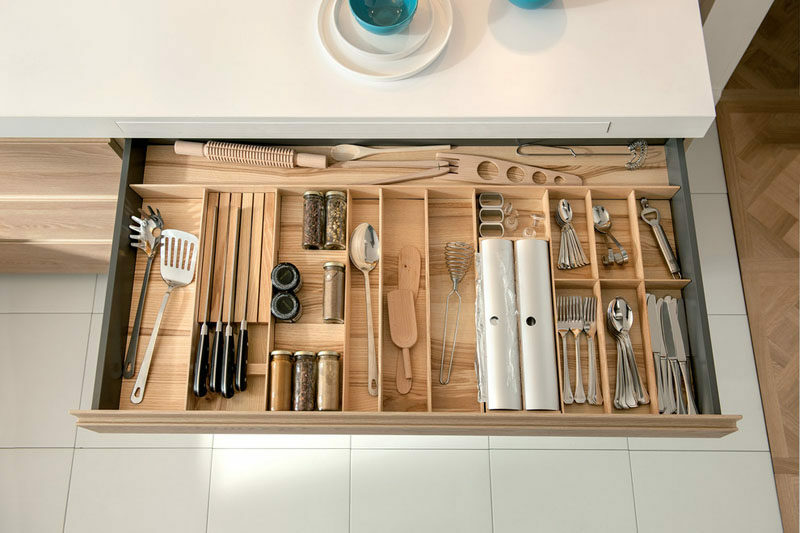 Everything in this super organized drawer fits into a specific carved out space to prevent things from getting messy and to help keep track of the utensils. 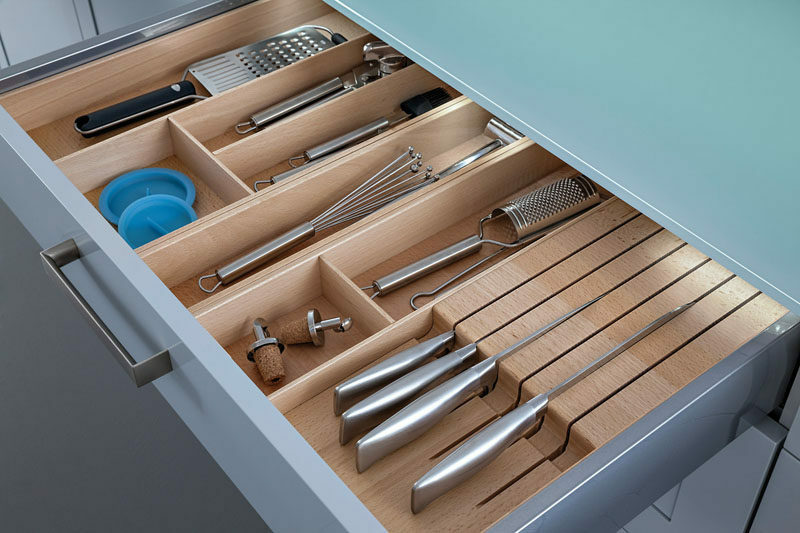 The middle section of this custom drawer organizer features long slits to perfectly accommodate knives and prevent them from floating around freely. 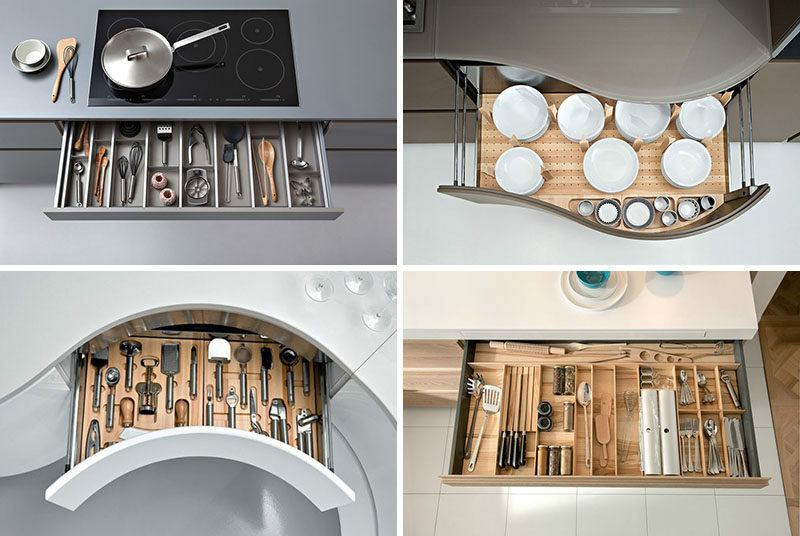 Wide compartments in this cutlery drawer provide plenty of space for storing things and has room for larger utensils that need somewhere to go. Well organized drawers like these ones make it easy to find where things go and put them away properly. 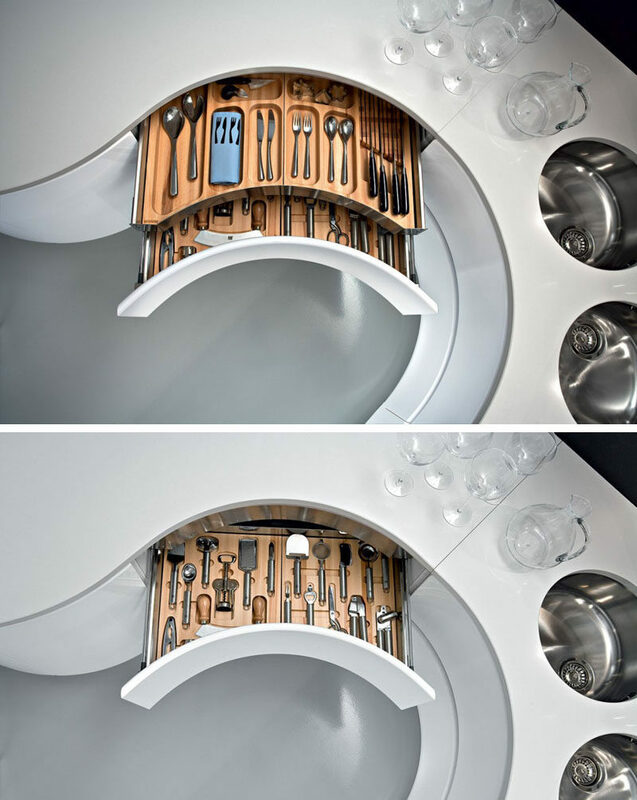 Having your knife storage solution built right into your drawer makes life so much easier. They’re at the perfect angle to pull out, they’re off the counter and out of the way, and they’re well out of reach of tiny hands. 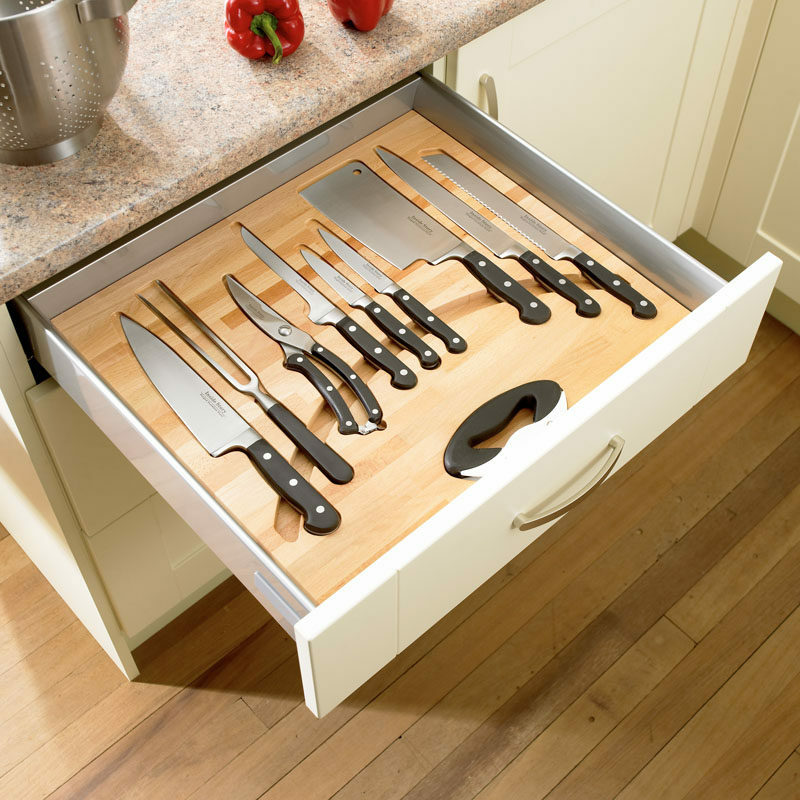 The blades of the knives stored in this drawer are completely encased by the wood, preventing any accidental cuts and ensuring you pick up the knife from the right spot. Carre 2 Kitchen designed by Leicht. Each knife in this drawer has a cut out so it always fits just right. And the groove along the bottom lets you easily grab your knife without having to dangerously fumble around with it. The knives in this drawer are tucked into the protectors and rest on an elevated piece of wood to create a gap that makes picking them up much easier. 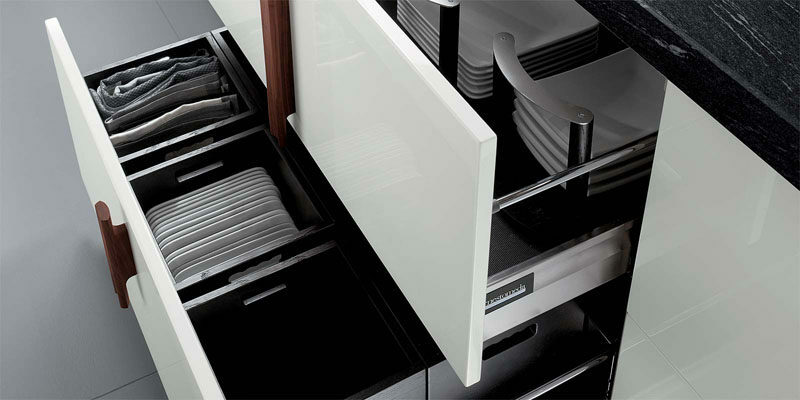 Storing your dishes and plates in drawers is a convenient way to free up cabinet space and puts them in an easy to access location. 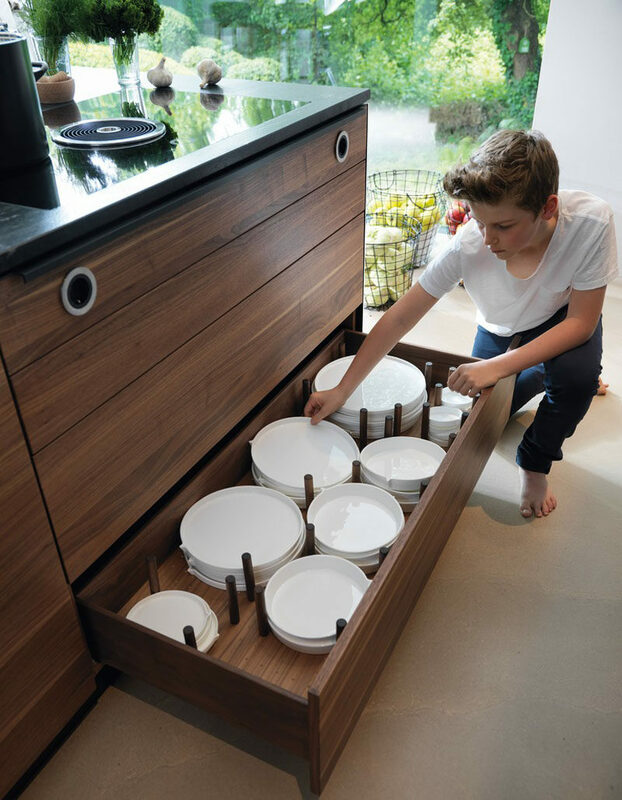 As long as you have some way of securing them, like with dowels, slots, or dividers, and don’t slam your drawers when you close them, your plates will live long happy lives tucked away in their drawer. Non-slip material lines the bottom of the drawers to make sure the plates don’t slide around, and dividers ensure that the plates stay where they’re supposed to. Dowels with curved edges hug the sides of these plates to create a snug spot for the plates and to keep them from moving around as the drawers open and close. 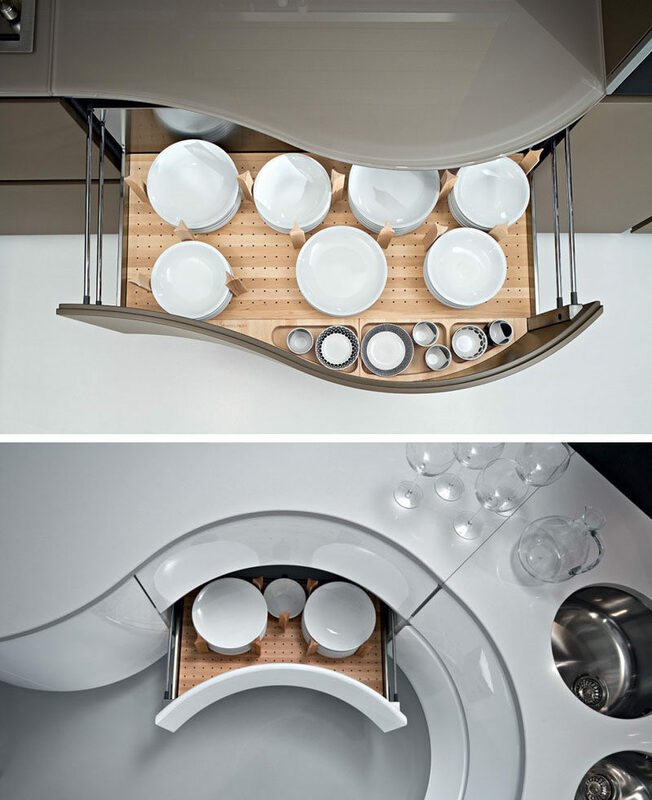 Cylindrical wood dowels create individual sections for the plates to sit in to maximize storage space and to protect the dishes. 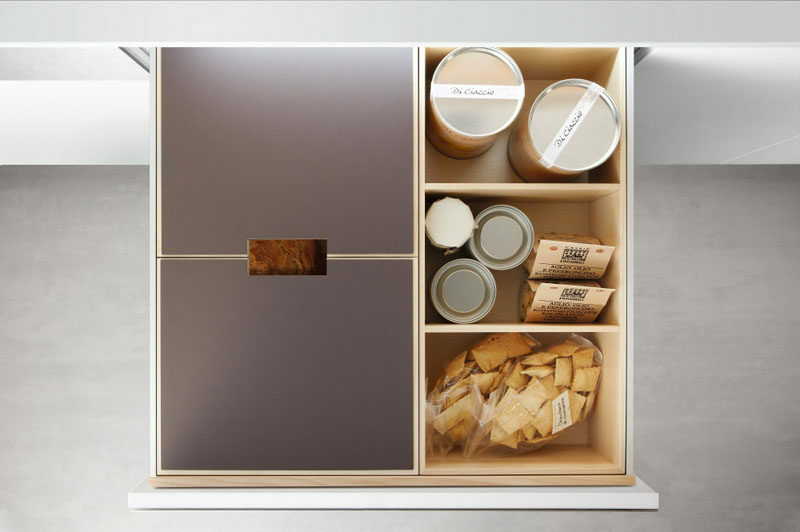 Drawers are also a great place to store different kinds of food. 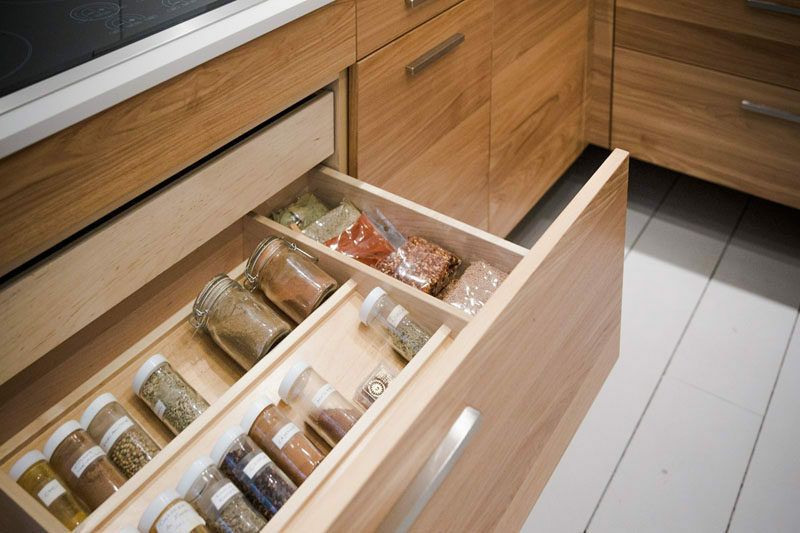 From spices, to bread, to chips and wine, drawers can hold it all and let you see what you’ve got much easier than the dark depths of a cupboard. This drawer has a covered spot perfect for storing loaves of bread as well as divided sections for storing other bits of food. A well organized spice drawer where you can actually find the spice you’re looking for makes using spices so much easier. Designed and built by Gepetto. Photography by Thierry Lacasse.